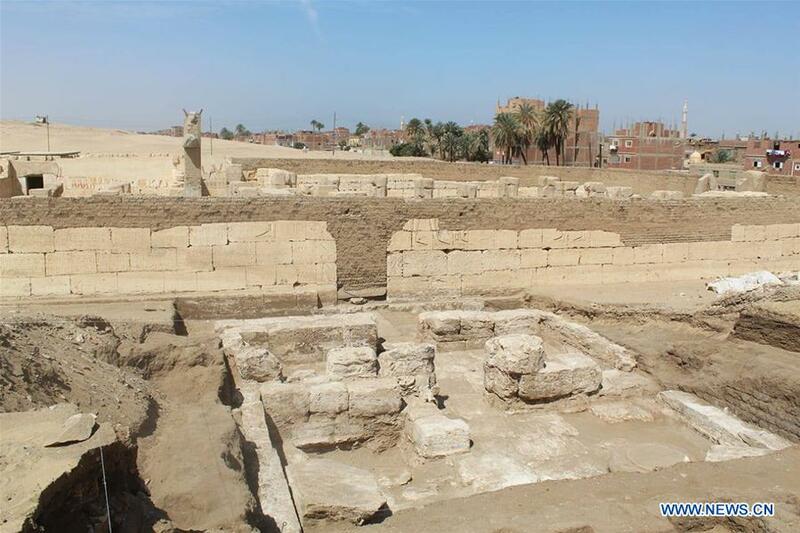 CAIRO, March 28 (Xinhua) -- An archaeological mission from the University of New York discovered a royal hall annexed to Ramses II temple in Abydos city of Sohag province, southern Egypt, the country's ministry of antiquities said in a statement on Thursday. The team also discovered the temple's foundation stones and paintings. "The new discovery will change for the first time the shape and the map of the temple that was discovered about 160 years ago," said Mostafa Waziri, secretary general of Egypt's Supreme Council of Antiquities (SCA), in the statement. The SCA chief added that the architectural design of the temple's annexes, including the palace and the royal hall, simulates that of the annexes of the temple of King Seti I, father of King Ramses II, located about 300 km southward. "The discovery will also add to our knowledge about the design and shape of temples and their annexes in the Ramesside period," Waziri stressed. The walls of the royal hall are made of limestone and adobe, while its floor is covered with limestone tiles, according to Ayman Ashmawi, head of Ancient Egyptian Antiquities Sector. "The team also found a base of a sandstone column as well as sandstone steps bearing the name of King Ramses II, in addition to rock masses with remains of drawings of stars that once decorated the hall ceiling," Ashmawi added. Head of the archaeological mission Sameh Eskandar said that it is the first time for a team to discover foundation stones of the temple with all of them bearing the name of King Ramses II. Ramses II, also known as Ramses the Great, was the third pharaoh of the 19th dynasty. He ruled ancient Egypt about 3,300 years ago, leaving behind a rare legacy of monuments including his well-known great temple in Abu Simbel, Aswan, southern Egypt.